The administration of the State is carried out in the name of the Governor but practically the real authority is vested in the Council of Ministers. 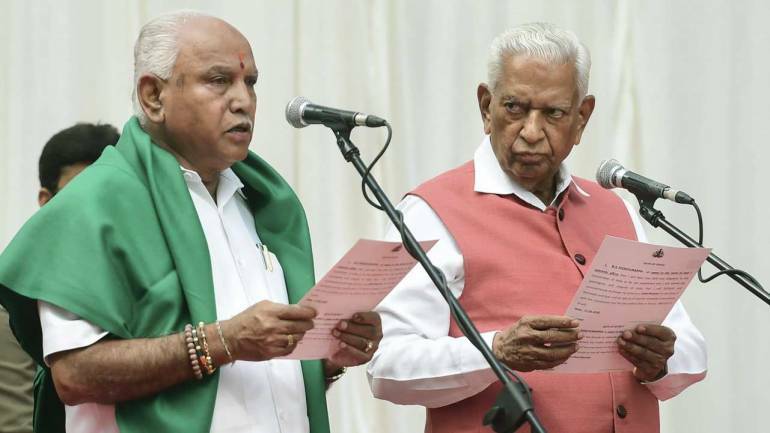 Normally, Governor acts according to the advice of his Council of Ministers. However, Constitution has also vested the Governor with certain discretionary powers, which he can use without the aid and advice of the Council of Ministers or in other words, in the discharge of these functions the Governor concerned is not bound to seek or accept the advice of his Council of Ministers. Governor uses his discretion in the appointment of the Chief Minister, where after the General Assembly elections, no single party or group commands absolute majority. He may call such person to form the government to whom he thinks fit to form the government. Similarly, if after the death or resignation of the Chief Minister on any political ground or after the defeat of the Chief Minister in the House, any party or group is not in majority, the Governor may appoint such person as the Chief Minister to whom he thinks fit. (vi) in reserving bills for president’s consideration. The Sarkaria analysis was devastating in terms of exposing everything that was wrong about governors and their discontents. As far as selecting a chief minister and cabinet was concerned, it used the test of “most likely to command a majority,” whether as a single party or combination. But most importantly, it suggested that if a chief minister does not have an absolute majority in the assembly, he should seek a vote of confidence within 30 days of taking over. This means that parties without a majority can appoint a chief minister even if they do not have a clear majority, subject to testing the confidence of the house. The National Commission to Review the Working of the Constitution (NCRWC), also known as Justice Venkatachaliah Commission, reiterated the Sarkaria Commission in many ways as did the Punchhi Commission on what should be a good governor, noting that these concepts were approved by the Supreme Court in Rameshwar Prasad & Ors vs Union Of India & Anr (2006). But what was interesting were the NCRWC’s views on the selection of a chief minister by making a distinction between ‘pre’ and ‘post’ election coalitions. This is important to democracy because a pre-election coalition has a mandate whereas a post-election coalition is put together by political conspiracy. Para nine of 6th schedule is related to the licences or leases for the purpose of prospecting for or extraction of minerals. It provides that “such share of the royalties accruing each year from licences or leases for the purpose of prospecting for or extraction of minerals guaranteed by the government of the State in respect of any area within an autonomous District as may be agreed upon between the government of the State and the District Council of such District shall be made over to that District Council. It further provides that if any dispute arises as to the share of such royalties to be made over to a District Council, it shall be referred to the Governor for determination and the amount determined by the Governor in his discretion shall be deemed to be final. Article 371 of the Constitution provides that the President may confer special responsibilities upon the Governor with respect to the State of Maharashtra and Gujarat for the establishment of separate Development Boards for Vidarbha, Marathwada, Saurashtra, Kutch and the rest of Gujarat with the provision that a report on the working of each of these Boards will be placed each year before the State Legislative Assembly. Article 371 A of the Constitution has conferred special responsibilities on the Governor of Nagaland for certain purposes. The Governor after consulting his Council of Ministers, shall exercise his individual judgement as to the action to be taken. These responsibilities are: with respect to law and order so long as internal disturbances occur in some areas of that State; to establish a Regional Council for Tuensang District; to arrange for equitable allocation of money between Tuensang District and the rest of Nagaland. Article 371 C of the Constitution confers special responsibilities upon the Governor of Manipur to secure the proper functioning of a Committee of the Members of the Legislative Assembly consisting of the members representing the Hill Area. Article 371 F (g) of the Constitution confers special responsibilities upon the Governor of Sikkim for peace and for an equitable arrangement for ensuring the social and economic advancement of different sections of the population of Sikkim. Article 371H (a) of the Constitution confers special responsibilities upon the Governor of Arunachal Pradesh with respect to law and order in the State of Arunachal Pradesh. However, the Sarkaria Commission recommended that “before taking a final decision in the exercise of his discretion, it is advisable that the Governor should, if feasible consult his Ministers even in such matters, which relate essentially to the administration of a State”. Such a practice will be conducive to the maintenance of healthy relations between the Governor and his Council of Ministers. Article 239 provides that a Union Territory shall be administered by the President through an Administrator or a Governor of a State, adjoining Union Territory, may be appointed as the Administrator of that Union Territory. Where the Governor of a State is appointed as the Administrator of an adjoining Union Territory, he shall exercise his functions as the Administrator without the aid and advice of his Council of Ministers. When a Bill has been passed by the Legislative Assembly of a State or, in the case of a State having a Legislative Council, has been passed by both Houses of the Legislature of the State, it shall be presented to the Governor and the Governor shall declare either that he assents to the Bill or that he withholds assent therefrom or that he reserves the Bill for the consideration of the President. f) Dissolution of State Assembly:The Governor has the power to dissolve the Legislative Assembly.